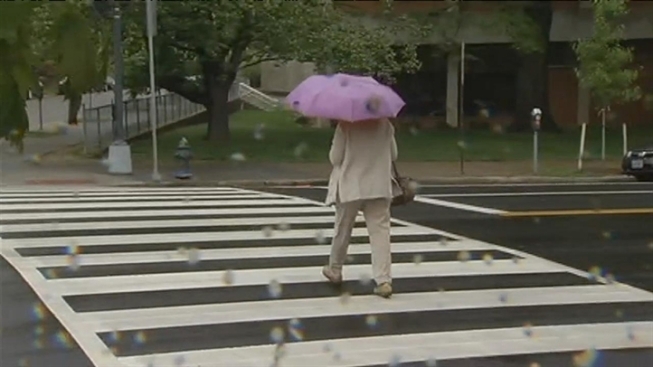 D.C. Mayor Vincent Gray went to Chevy Chase Tuesday to see a new pedestrian crossing that causes confusion for some. The new, high-tech HAWK pedestrian signals at the intersection of Connecticut Avenue and Northampton Street is getting mixed reviews. When a pedestrian presses a button, the lights flash yellow, and then turn solid yellow. When the light turns red, the pedestrian gets the walk sign. "We think this will improve pedestrian safety in the city, and those who don't observe it, they will be ticketed," Gray said. After a record low eight pedestrian fatalities in the city last year, five have been recorded so far in 2013. Keeping the roads safe doesn't always come cheap. The latest high-tech pedestrian signal carries a price tag of $126,000, according to DDOT. Some estimates from the city show that the cost of the HAWK signals can go as high as $200,000. Bill Steinman, who works in a building that overlooks the pedestrian crossing, told News4 that after seeing close calls and accidents for years, something needed to be done about the intersection. "It's running the gauntlet to get across here before this light was installed,” he said. “It was a horribly dangerous intersection, and this will make it better." The city plans to put another one of the HAWK signals at the intersection of 11th Street and Florida Avenue in Northeast, the site of a recent deadly pedestrian accident.